/eyebrow waggle...now that I have your attention...take a look at the sidebar or click here to take a peek at the new items in my Etsy shop! I added a couple of different note cards as well as the last of the birth announcements. I've got two or three other items in the works. The one I want to list next isn't cooperating so I'll be working on that this week. Back to the cinnamon roll photo above, I have to confess that every time I reread Sunshine by Robin McKinley (all Twilight fans should read that book if you want a fantastic, unique vampire story), I make cinnamon rolls. I admit it's an odd association but Sunshine, the main character, is a baker and she makes Cinnamon Rolls as Big as Your Head throughout the whole book. 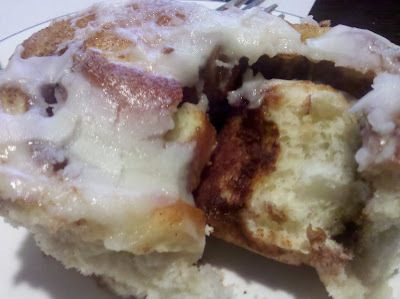 Oddly enough, by the way, if you Google Cinnamon Rolls as Big as Your Head, a lot of bloggers appear to read Sunshine and then bake cinnamon rolls! I've had a variety of results over the years (yes. years. I reread Robin McKinley books alllll the time) but I think I found the magic recipe. Several friends have asked for it based on the photo above which I posted on Facebook and the times I've taken them to gatherings so I'm just going to put it here and refer people. :) I cobbled this together from three different Cook's Illustrated recipes and made a couple of changes. I'll note what Cook's calls for and what I changed. And I took some pictures since sometimes instructions don't help me a whole lot when it comes to yeast bread. Not that I *really* know what I'm doing but this is what works for me plus some of the shortcuts might be helpful. This is a terrible photo but I thought it was hilarious. Autumn doesn't care for loud noises or bright lights. I used the flash and she was all "oh, noes!" Now, the first thing you're supposed to do is melt the butter into the milk. The directions say to use a saucepan, I did it in a liquid measuring cup in the microwave with no trouble. Just as a heads up, it takes a while for the mixture to cool down and if you don't have an instant read thermometer, I highly recommend it. The one I have is a Cook's Illustrated Best Buy. I don't like to use hot water from the tap when I cook so I heat up the 1/2 cup warm water in the microwave, also. It only took like 45 seconds or so. I let the yeast do its proofing thing while I was doing all this. I ended up having to use all the flour which I think can depend on the humidity and all that fun stuff. The dough stayed pretty sticky at the bottom of the mixing bowl but I think the right amount of flour is when it isn't sticking to the sides. When I emptied the dough onto my work surface, I was a little worried about how sticky it was but don't be tempted to knead too much extra flour in. I've done this three times and the times I floured the board well and then added juuuuust enough to smooth it out some were the two best batches. It was a little floppy when I cut the dough up in the next step but the finished product is worth the trouble. Unfortunately, my pictures are from the day I over floured. This is too much flour mixed in but you get the idea of what it should look like. I spray my proofing bowl with butter flavored Pam. I know some people might be horrified but, really, I'm too lazy to do real bowl buttering or oiling. This is after rising! Our house is always cold so I tend to proof bread in our oven. I turn the oven to 100 degrees and then before I put in the dough, I turn off the oven. Sometimes I put a bowl of water in the bottom if I need some humidity. I start checking my dough at one hour because it usually doesn't take a full 2 hours for it to double. If you've never been to Penzey's Spices and live near one, I highly recommend stopping by! I looooove going in there. I use one of their cinnamons and having high quality spices makes a huge difference. I've also found that their spices are often comparable or less expensive than grocery store spices. I use more cinnamon and sugar than the original recipe calls for because I really like the powder to be bursting from the seams. I also had better luck rolling out the dough on a slightly floured board, although I believe the recipe says to use an unfloured one. Rolling it up is kind of fun. If the dough is the right amount of sticky, it'll be kind of ugly but I promise it'll be okay once everything has gone through the second rise. I use a bench scraper but dental floss or a serrated knife will cut the dough just fine. Cut the roll in half, then those pieces in half. And then cut each quarter roll into three pieces. Mmmmmmm. It already looks so good. I took the rolls out when they were pretty much done rising and let them finish up on top of the stove while I preheated the oven. I thought using the thermometer to judge whether or not the rolls are done was a clever idea. One tip: don't be crazy like me and accidentally set your thermometer to Celsius instead of Fahrenheit unless, of course, you regularly use Celsius to measure temperature. I had to use that one again. I seriously took photos with my regular camera and not one turned out as well as this phone one, haha. Ok, now I will wrap up THE LONGEST POST IN THE WORRRRRLD with the actual recipe. I hope my prattle hasn't confused or bored anyone. 1. For the dough: Heat milk and butter in small saucepan over medium heat until butter melts or do it in the microwave. Cool to lukewarm (about 110 degrees). 3. Grease a 13-by-9-inch baking pan. Mix sugar and cinnamon in small bowl. 8. For the icing: While buns are cooling, line rimmed baking sheet with parchment paper (for easy cleanup); set rack with buns over baking sheet. Whisk cream cheese and milk in large nonreactive bowl until thick and smooth (mixture will look like cottage cheese at first). Sift confectioners' sugar over; whisk until smooth glaze forms, about 30 seconds. Spoon glaze evenly over buns.